Fall is my favorite season. And so far this fall is shaping up rather nicely. Thank you, Vancouver, for the sunshine, the warm days and the crisp evenings. You are a pleasure! I’m sure when the rainy, grey days seem to never end I’ll be thinking differently, but for now, all is good in my blissful autumnal world. This past weekend, I got into the kitchen with the purpose of making it smell like fall. I wanted to make a soup stuffed with orange things: sweet potatoes, yams, and carrots. And I wanted the warm smell of curry to perfume the air and make everything cozy. So I chopped all my vegetables into a fine dice and got this soup going quickly. It’s an easy one and perfect to whip up for a weeknight meal. My husband and I were heading out to a show that evening (the band Caribou was in town & we weren’t going to miss them again), so this was a meal that could fill our bellies and give us the power to ride our bikes to a show downtown on a Sunday evening. Now, as you can tell from the photos, this soup became more of a stew as I got caught up in cleaning and tidying. Now this wasn’t a bad thing. For my husband, an infamous soup-hater, this was in fact a wonderful thing! However, I do think this dish would work a bit better as a soup, especially since the vegetables are so small and uniformly diced. And I kind of miss soup because I am – unlike my husband – a bona fide soup person. The addition of rice in this dish is a nice element and because it’s incorporated into the dish rather than alongside, I think this gives more sway to the soup-side. I used 2 kinds of curry paste as I was finishing one jar and starting on another. One was mild and the other was spicy and the flavours combined to a lovely lingering spice. But if you love your curry hot or mild, use what you like. But soup or stew, I’ll leave it up to you and your preferences. Elsewhere: I’ve been around all over the place in the last little while. Keep up with my every-Wednesday posts at Poppytalk where you’ll find me mixing up a lemon curd & yogurt breakfast parfait that tastes exactly like pie, stuffing a slew of peppadew peppers, whipping up homemade pizza pockets, and waxing about my sausage-making roots as I give a recipe for spicy sausage and peppers. At ReadyMade, I discuss some of my favorite tips for not wasting food and give a little looky-loo for the quick meal standby: the pita pizza. In a large pot, heat olive oil and add in carrots, onion and celery and saute until fragrant, about 3-5 minutes. Add in the yam, sweet potato, rice and curry paste and let everything get coated. Sprinkle with salt and pepper. 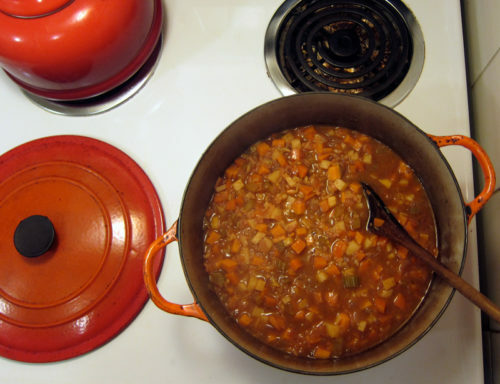 Pour water or vegetable stock over everything so the liquid level is about 1-3 inches above the vegetables. Use less liquid if you want a stew, more liquid if you want soup. Turn down heat to a simmer, put on the pot lid and let it bubble away for 20-30 minutes. Does it need more liquid? Add it, otherwise it’s done when the vegetables are tender. Finish it off with a small glug of maple syrup, stirring it into the mixture before serving into bowls. This looks wonderful! I love the combination of sweet potatoes and curry. this looks amazing! i myself am a fan of potato curries, so i think this is probably my kind of recipe. 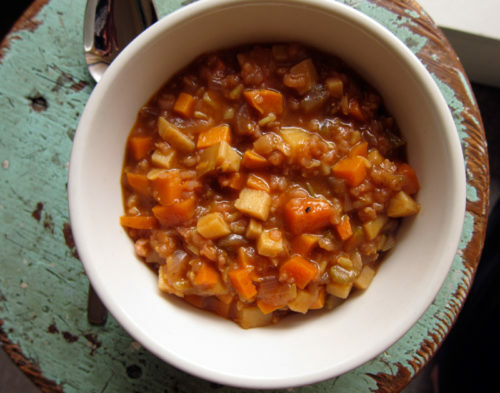 yay for fall, and yay for soups and stews!! 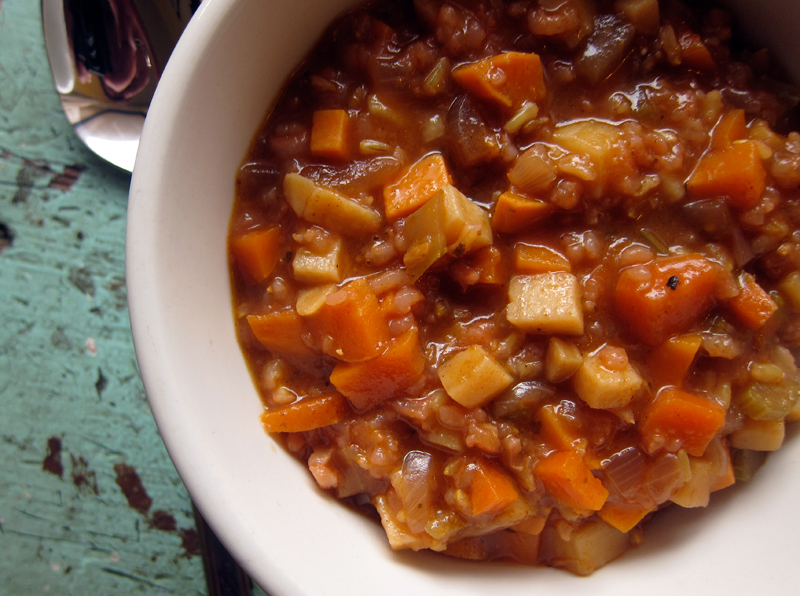 Curry and sweet potato are some of my favorite flavors, especially when they’re combined! This looks like the kind of stew I could eat for days and never get bored with! I love the looks of this recipe—sounds like a great excuse to use curry paste, which I’ve never tried before. And I like what you say about “making it smell like fall.” My boyfriend, who is *not* a baker, got really pumped today about baking something with pumpkin for the same reason. This autumn thing is contagious! Thank you so much for this — it is *exactly* what I need, today, this week, this season. Yum. Hmm, I still don’t know the difference between yams and sweet potatoes; I guess they’re not the same thing, are they! This stew/soup(stoup?) looks right up my alley! I love the idea of evoking autumn through smell and taste. this sounds fabulous. Mmm. Sweet potatoes. My husband would love you for making this soup so much like a stew. He’s a big fan. In fact, I think one of the reasons he loves me so much is that I make my chili seriously thick and chock full of veg. This looks amazing but my husband will not eat anything wihtout meat in it. Would you recommend throwing in some pulled chicken or something for my purposes? Thanks! Love your food! Mmm, yum! All of my favourite flavours, I can’t wait to try this! Why don’t men like soups? Sounds like the title for some Men are from Mars, Women are from Venus type book. Your stew looks delicious and warming! looks like another really warm and filling comfy food recipe for fall. thanks! I made this last night and added red curry paste and a can of coconut milk for more thai flavor. It was so delicious. Thanks for another great recipe! Tracy, I like what you’ve got going on there! Thanks Newlywed, they all work so nicely here. 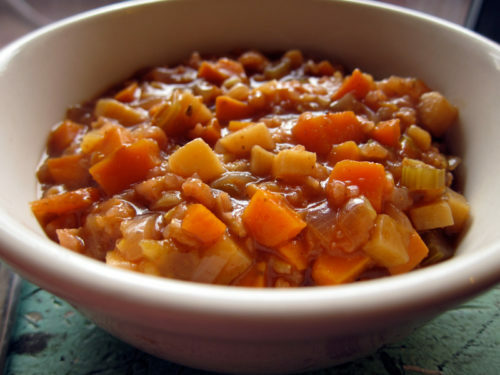 Bellcurves, I’m with you for soups and stews! Thanks Rachel, this only made enough for about 4 people, but it can easily be doubled. I use curry paste all the time, Maddie. Patak’s is my favorite brand – check it out! Glad I could help, Meister. Monika, I’ve always gone by light yellow = sweet potatoes, dark orange = yam. I think that’s correct! Yams have more moisture and are sweeter. Joanne, I gotchya 😉 Thanks! Lo, sounds like you’ve got a good chili recipe on the go! Thanks rice and wheat! Yes, I only know AraJane through the net as well (but I have a friend who’s met her in person and I know for a fact that she is just plain wonderful). It is all good flavours, enjoy, Becka! Yeah, what’s with that, Foodie?? Indeed. Thanks! Brenda, I think coconut milk is an excellent addition. Glad you enjoyed it! Update: I made this with ground turkey and it blew our minds. Andrea, so glad you enjoyed this! Yes, Patak’s curry paste is amazing! Curried sweet potatoes sounds delicious. I just picked up some sweet potatoes today and this may be the meal I prepare at some point over the long weekend. The colours of the stew are also very autumnal, or at least of the same colour as the leafs I can see on the floor outside the window in Oxford. I will give this dish a go, it looks ever so yummy! Bijoux, this meal is perfect for fall and I’m sure you’ll love it. Nicky, it’s true! The meal looks like fall and it tastes just a cozy. Mmmmm, yum yum! That looks incredible…I’m intrigued by the glug of maple syrup, I’d never have thought of that…I’ll be making this out of whatever is in the fridge tonight! Thanks! Funnily enough, I made this: http://www.guardian.co.uk/lifeandstyle/2010/oct/03/nigel-slater-lentil-pumpkin-soup-stew-baked-figs-recipes last week (topped with Greek yoghurt and with 4 cloves of garlic), and it was so good I’m making it again this weekend for the Friday-night part of my mother’s 70th birthday celebrations. apocalypsebakery, the glug of syrup helps to tame some of that heat and gives a nice little kick into fall! Heidi, that’s definitely another wonderful looking fall recipe! I need to make this immediately!!! YUM!!! Do it beth, it’s tasty good! YUM! This was super tasty. Shockingly I was out of rice when I tried it so I used quinoa instead – not bad and added an extra protein hit! Keep enjoying fall! Meghan, glad you tried it and that it’s so flexible. Quinoa would be great here, I’d imagine. Fall’s my favourite season too. 🙂 This looks like such a nice warm and comforting dish. This is what I am bringing to Thanksgiving tonight. I added some avocado though. Great recipe! Your blog is incredible. Going to make another batch this weekend to eat through out next week. Yumm I made this soup a couple of weeks ago. i forgot to put the maple syrup in!!! I guess I better make it tonight! It seems nobody else has asked this- is the rice uncooked before starting the stew? seems like using a mix of brown rice and white would mean the brown would not be done in the time alloted for the recipe. Living with a vegetarian, I’ve learned to love soups/stews for their ability to ‘flesh out’ (so to speak) a veggie meal. I tried out this recipe, and I liked it very much. I ended up removing the rice, adding cooked adzuki beans, and topping it with a bit of coconut milk because I managed to add in too much curry paste. This looks lovely and simple – I think I might try and do a crockpot version since it is getting a bit hot for cooking around here. I love your red pot too! Is it Le Creuset? Do you think I could put all of this in the crockpot? We are in the middle of a kitchen remodel so we’re limited on appliances. It sounds amazing!